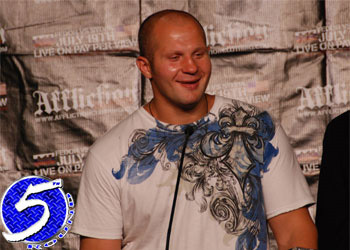 Fedor Emelianenko is the hottest name on the MMA free agent market. The only problem is, the heavyweight still has one fight remaining on his current Strikeforce deal. Nonetheless, it hasn’t stopped M-1 Global figurehead Vadim Finkelchtein from laying all his Octagon cards on the table. 1. We would like to receive guaranteed payments. I know that if we agree for percents, they will cheat us. 2. Maybe not a co-promotion (like we offered before), but at least co-branding. Are you reading this, Mr. Dana White??? For years, the primary sticking point between the two parties was M-1 Global’s undying insistence on sharing half the profits for all Fedor produced shows. With their meal ticket’s abrupt exile from the land of The Invincibles, the Russians now appear willing to play ball – as long as it’s on their (modified) terms. As far as who they would prefer Fedor to face in his next outing, Finkelchtein professed it was a no-brainer. “We are ready to fight against anyone, but everyone agrees that the most interesting fight right now is the rematch against Fabricio Werdum. We have one fight left on our contract, so if Strikeforce wants to extend it, they should listen to our opinion,” Finkelstein said. The reason is clear why M-1 Global is pushing for an immediate mulligan. Werdum not only snapped Emelianenko’s 27-fight win streak last month, but quickly dispelled his unparalleled aura of invincibility as well. The best way to recapture that mojo is by violently rectifying the “fluke” defeat – ala what Georges St-Pierre did to Matt Serra in their UFC 83 rematch. Still no official word on when and where Fedor will finalize his commitment to the San Jose, California based promotion.